Presenting “Private and Corporate Business Opportunities at World Cup 2022 in Qatar”. Die 6. Sitzung der Deutsch-Katarischen Gemischten Wirtschaftskommission (GWK) wird unter dem Ko-Vorsitz des Parlamentarischen Staatssekretärs im BMWi Thomas Bareiß, MdB, und dem Minister für Handel und Industrie des Staates Katar, S.E. Ali Alkuwary, stattfinden. 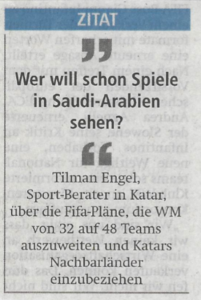 “Whoever wants to watch (World Cup) games in Saudi Arabia?” Regarding plans to host games of a boosted 48 team tournament in other regional Gulf countries. From October 22nd – 25th, SBC International Consulting organized a Qatar exploration trip for World Cup and major event suppliers. During four busy days, suppliers were introduced to a wide variety of public and private stakeholders active in the preparation and implementation of up-coming mega-sports and convention events. Through in-depth case discussions, the international participants learned about the various formats of corporate registration in Qatar, potential (JV) partners, developing business opportunities, as well as about particular local challenges resulting from the future accommodation of hundreds of thousands of fans and spectators. 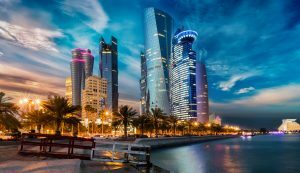 Official and governmental entities stressed the need for a timely corporate registration, in order for suppliers to bid for public tenders related to more immediate mega events just as the 2019 IAAF World Championship in Doha. Future exploration trips will match further international suppliers with local opportunities and partners. On the final evening the group enjoyed a VVIP invitation by the Commissioner of the Qatar Stars League at the game of Al-Rayyan vs. Al-Sailiya at Hamad bin Khalifa (Al-Ahli) Stadium. Session 1. Financial Sector: A solid line of defense for economic security and project financing. Session 2. Investing in Germany: Great opportunities and guaranteed success. Session 3. Industrial Development: Key to Doha and Berlin to diversify sources of income. Session 4. Qatar Economy: Growth indicators of a real successful partnership. Session 5. Education, Tourism and Sports: The Road to World Cup 2022. From June 27th – 28th, MEI hosted the Major Events Summit, where expert suppliers, host cities, federations & clubs joined together to share knowledge & network to increase opportunities in the Major Event Markets. The format allows everyone to participate in workshops and panels where possible allowing all delegates a chance to speak about past experience. On June 28th, Tilman Engel, Managing Director of SBC International Consulting spoke on the upcoming mega events in Qatar, Business opportunities and challenges for 2019 – 2022. 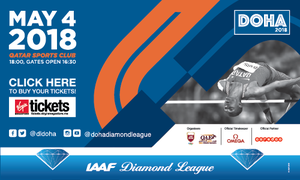 Meeting with LOC and preparing promotion and business options for Berlin 2018 Athletics European Championships and 2019 IAAF World Championships in Qatar September 28 – October 6th, 2019. 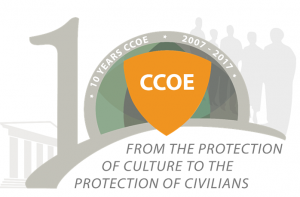 The Hague, October 10th 2017 – honoring President of Republic of Croatia, Kolinda Grabar-Kitarovic and UN OCHA CMCS with keynotes by Karl von Habsburg-Lothringen (Blue Shield International), FRONTEX, and City of The Hague. Katar – Wie tickt das reichste Land der Welt? Katar, ein Land kleiner als Hessen und trotzdem reicher als alle anderen Länder der Erde. So richtig weiß aber keiner, wie die Menschen im Land der Fußball-WM 2022 ticken. Wir sind hingefahren und haben exklusive Einblicke bekommen. Collaboration on preparing, managing and delivering nationwide media and communications campaign for Berlin B2B and sports science conference. Developing, leading and implementing multi-level media, marketing and (digital) communications projects towards NATO and external civilian stakeholders in media, government, public administration, as well as with key IO, GO and NGO institutions in complex crisis situations and humanitarian relief. Media, marketing and communications launch and official opening of business incubation center for German and international medium sized companies in Doha, Qatar. Leading ISAF / Bundeswehr Afghan Presidential Election 2014 Monitoring and Analysis Group and international Election Working Group at ISAF Regional Command North, Camp Marmal, Mazar-i-Sharif, Afghanistan. Assigned as German Army Civil – Military Cooperation (CIMIC) officer for Governance and Rule of Law to ISAF Regional Command North, Islamic Republic of Afghanistan. Under the patronage and in the presence of H.E Sheikh Hamad Bin Jassim Al Thani, Prime Minister and Minister of Foreign Affairs for the State of Qatar, the Business and Investment in Qatar Forum will be convened this year in Berlin, in Germany from 15 to 16 April 2013, with the participation of high officials from Qatar and Germany. This year’s forum is convened while Qatar is setting an example of economic excellence regionally and internationally, based on a clear vision that depends on strategic use of the country’s surplus from oil and gas, and its foreign investment policy, in the aim of developing a competitive and open economy. The vision and strategy will provide bigger investment opportunities for the private sector and broaden the knowledge base of the society to insure prosperity and progress for the coming generations. 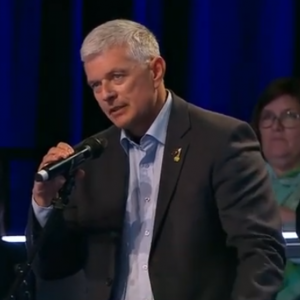 Fachbeiträge ausgewiesener Katar-Experten, Praxisbeispiele erfolgreicher Unternehmer vor Ort, Podiumsdiskussionen und die Möglichkeiten zu individuellen Gesprächen und Vernetzungen bieten die Möglichkeit, sich umfassend und aus erster Hand über die realistischen Chancen eines unternehmerischen Engagements in Katar zu informieren. The Institute of European Sport Development and Leisure Studies takes responsibility for the political science activities of the German Sports University referring in particular to the European dimension of sport and leisure studies. Key focuses of the institute are the areas “Sport Politics” and “Leisure and Tourism-Studies”. “FIFA World Cup Qatar 2022: Eine etwas andere Betrachtung über die Bedeutung dieser Veranstaltung für deutsche Unternehmen”. –> Ist die WM in Qatar so sinnlos und für uns in Europa sogar ohne Bedeutung? Für und nach der WM entstehen neue Chancen für deutsche Unternehmen. Bei der FIFA Weltmeisterschaft in Qatar in 2022 ist es wichtig, sich zunächst vor Augen zu halten, wie Geschäftspraktiken und sozialer Umgang in Qatar funktionieren, welchen Weg das Land vor sich hat zur Verwirklichung der “Nationalen Vision 2030”. analysiert die sich daraus entwickelnden Perspektiven für europäische Investitionen und Projekte im Vorlauf sowie der Zeit nach der WM 2022. 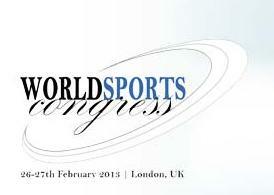 World Sport Congress 2013: The exclusive high profile meeting showing how to align sports infra-structure and commercial viability. 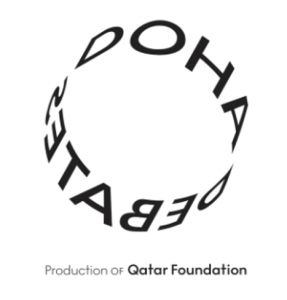 Presentation: Qatar World Cup 2022: a perspective from the other 180 degrees. With FIFA World Cup set to take place in Qatar in 2022, it is important to consider certain aspects of Qatari procurement requirements, in order to ensure that pursuing sport business in Qatar is as smooth as possible. This session will consider the role the World Cup as a catalyst for Qatar National Vision 2030, explore key challenges in demographics, organisation, infra-structure and culture, highlight the national and international actors in the market place, look at Qatar-European sports investments and projects into the future by envisioning perspectives for infra-structure beyond 2022. Presentation by Tilman Engel, Frankfurt, Germany. 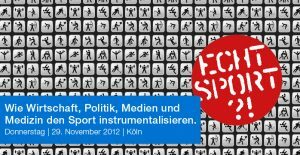 Sport fasziniert Millionen, wird aber immer mehr instrumentalisiert für Interessen, die mit Sport wenig zu tun haben. Ist das noch „Echt Sport? 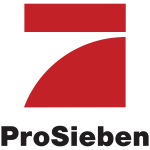 !“ – dieser Frage stellen sich prominente Sportler, Funktionäre, Politiker, Journalisten und Forscher bei einer Tagung am 29. November 2012 in Köln. Unter den Referenten der Fachtagung „Echt Sport! ?“ sind Prominente wie Ex-Fifa-Funktionär Guido Tognoni, DOSB-Chef Michael Vesper, Gendopingforscher Perikles Simon, Journalisten wie Thomas Kistner und Wolf-Dieter Poschmann, internationale Sport-Ökonomen wie Tilman Engel, Medien- und Sportforscher wie Jürgen Mittag und Thomas Horky. Doha GOALS 2012 brought together almost 1,000 leading policymakers, innovators, NGOs and foundations, sports scientists, physicians, federation heads, academics, athletes, corporate executives, competitors and students from around the world to discuss opportunities for growth through sport, as well as sport’s role in tackling social issues. Die gesamte arabische Welt spürt die Auswirkungen des politischen Umbruchs in Nordafrika. Während hier die Investitionstätigkeit noch stockt, modernisieren die Golfstaaten weiter und fördern massiv den Ausbau der sozialen Infrastruktur: Verkehrswege, Krankenhäuser, Bildungseinrichtungen. Wie können sich deutsche Unternehmen erfolgreich einbringen? Coliseum Summit is a conference and networking event dedicated to the various challenges and solutions and the lessons which can be learnt, relating to the sports venue sector in the Middle East. The summit will consist of an international conference day with exclusive presentations, case studies and interactive panel discussions. 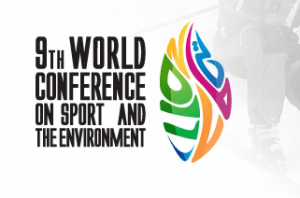 The International Centre for Sport Security (ICSS) has today announced that its 2nd International Sport Security Conference will take place in Doha on 14thand 15th March 2012 and will focus on ‘Creating a Platform For Growth Through Safe Sporting Events’. The annual event brings together key decision-makers, experts and practitioners in sport security from around the globe. 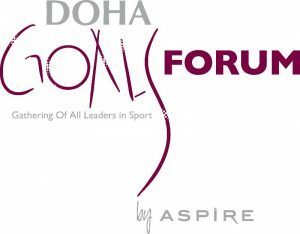 The 2nd staging of ASPIRE4SPORT, the International Sports Congress & Exhibition, will take place in and around the stunning Aspire Dome in Doha’s Sports City on November 12-15, 2011. 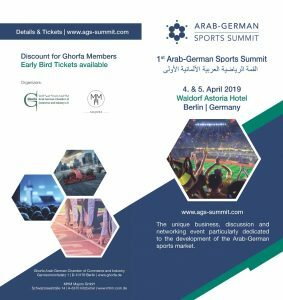 ASPIRE4SPORT is the only event of its kind in the Middle East, fully dedicated to sports and the sports industry, and has firmly established itself as the premium regional platform to market expertise and solutions related to the sector. Join SBC International and our partners at the “Aspire 4 Sport” Conference to share the latest updates on the sport business developments driving this unique market place. 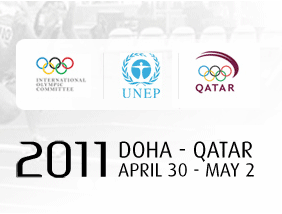 The aim of these conferences is to regularly assess the progress made in the field of sustainable development by the Olympic Movement; to give an opportunity to provide new knowledge on these issues by sharing experiences and expertise from different sectors of society and to encourage cooperation in, and further development of, environmental policies in relation to sport. Vorstandsberatung und Entwicklung einer umfassenden Markteintritt- und Umsetzungs- strategie für den Stadion – und Klimatechnikanbieter im Emirat Qatar: der individuell ausgearbeitete Maßnahmenkatalog berücksichtigt relevante Aspekte des national Infrastrukturplans „Qatar Vision 2030“, der Anforderungen von Qatar 2022 und der Aufgaben von Qatar Foundation in den Bereichen Forschung, Wissenschaft, Ausbildung und Lehre. Umfassende Analyse und Umstrukturierung der CRM, Vermarktungs- und Verkaufsprozesse. Entwicklung integrierter Geschäftsentwicklungsstrategien einschließlich aller Erlös- und Kommunikationsaspekte des Unternehmens. Unternehmerische und operative Re-Organisation, Aufbau eines an Kunden und Patienten ausgerichteteten Online-Auftritts und E-Business Entwicklung. Beratungsauftrag zu Analyse und inhaltlicher Neu-Ausrichtung des integrierten Online-Auftrittes. Inhaltliche Anpassung der regionalen Unterverzeichnisse und Dienste an die Dachmarke und Fokussierung auf die Optimierung des Nutzbarkeit für Regionen und Kunden / User. SBCI Presentation on “Strategic Planning, Implementation, and Business Management of Mega-Sports Events”. With special focus on the human resources factor in the development toward a knowledge based ecomomy in Qatar. Entwicklung eines integrierten Online, TV und Social Media Web 2.0 Auftrittes für den TV-Sender als zentralem Bestandteil eines umfassenden Re-Launchs. Kommunikation der strategische Neu-Positionierung des Medienunternehmens im regionalen Wettbewerbsumfeld. Entwicklung und Einbindung regionaler Community-Plattformen als Grundlage für die Differenzierung des werblichen Angebots. Large scale sport project development work for TMA Dallas on behalf of Tostitos / Frito Lay. Staging of a U.S. College NCAA Football Bowl Game for the U.S. Military audience in Germany in Frankfurt`s Commerzbank Arena.